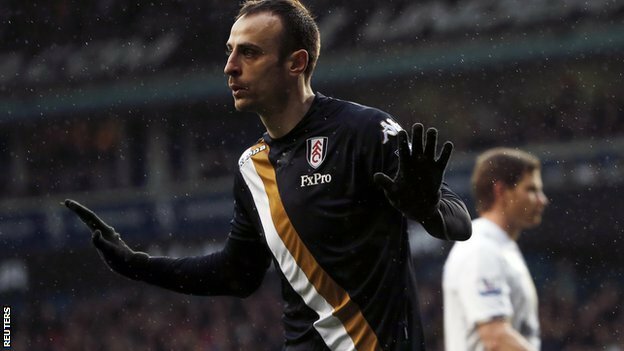 Dimitar Berbatov scored the only goal of the game against the surprisingly lackluster Tottenham to record Fulham’s third away win of the season. Despite Welsh wizard Gareth Bale returning in the first XI, the Spurs looked fatigued and demoralized after their 4-1 defeat against Inter Milan at San Siro and hardly disturbed Mark Schwarzer in the first half of the game. No wonder it was namely Gareth Bale responsible for the most dangerous chances in the first 45 minutes with his header being cleared off the line by Fulham’s defender. With both sides struggling to create chances the game could go either way, but it was Dimitar Berbatov who tucked home from Riether’s cross in the 51st minute. Mark Schwarzer twice denied Defoe’s attempts on goal with two incredible reaction saves to earn the man of the match award. Tottenham’s defeat saw them slipping to a fourth spot in the Premier League table with Chelsea climbing above them into the third spot.